This American tank design inspired BT-7 model 1935 Russian Soviet WW2 'Fast' Tanks can be found at the Central Armed Forces Museum in Moscow, Russia. Soviet WW2 BT-7 model 1935 tank with sloping armour and Christie suspension. The BT series of tanks were the fast tanks. They were the accompanying support vehicles for the slower moving infantry 'land battleship' tanks like the T-28 and T-35. They were built in large numbers between 1935 to 1940. Estimates vary from between 2,700 to 5,300. The BT-7 should be remembered as the main battle tank of the Soviet Army that bore the brunt of fighting trying to stop the German invasion of 1941 during Operation Barbarossa. BT-7 tanks were also used in the 1939 Winter War in Finland and again during the 1939 Russian invasion of Poland. They remained in active operational service until the end of the war in 1945, many being redeployed to the eastern battle fronts fighting against the Japanese who did not posses so many advanced tanks as the Germans. It's hull armour thickness varied from between 10 mm to 20 mm. The turret armour ranged from 10 mm to 15 mm. 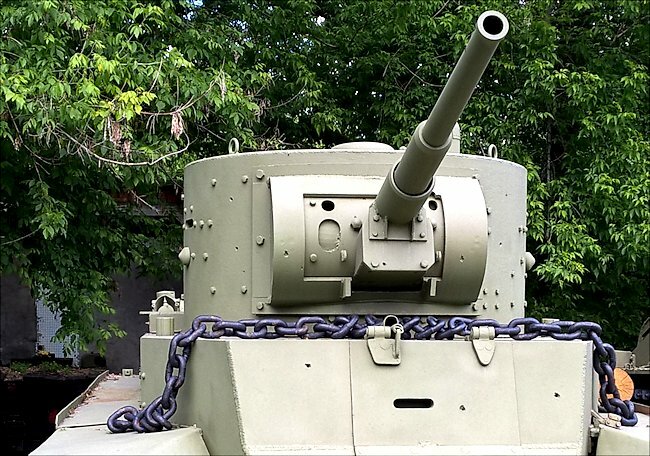 The BT-7 was armed with a 45mm L/46 cannon and had two 7.26 mm DT machine guns. It was powered by a Mikulin M-17T V12 petrol engine that produced 450bhp. With the tracks removed it had a top road speed of 72 km/h (45mpg) With the tracks on it had a cross country off-road speed of 50 km/h (31mpg) which was very fast compared to other tanks of this period. It had a crew of three: driver, commander and gunner. 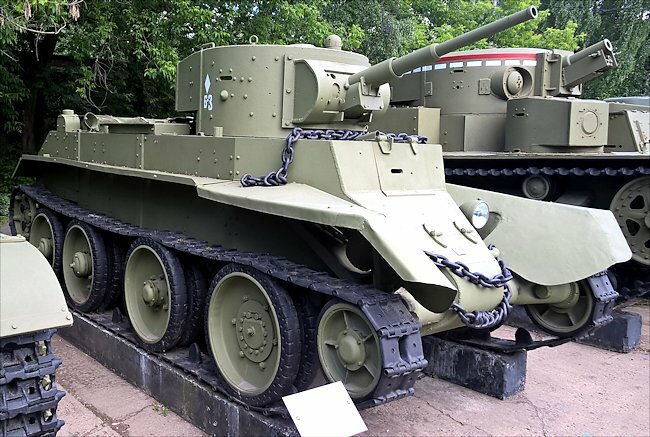 Early Soviet BT-7 tanks has the same turret design as the BT-5 tank. The American engineer J Walter Christie was obsessed with speed. He was ahead of his time. In the 1920s and early 1930s military wanted heavily armoured slow-moving tanks to provide support for the advancing infantry. Not fast moving cavalry tanks. The Christie suspension system was used on many early Soviet tanks from the T4, BT-2, BT-5 to the BT-7. What is unusual about a tank of this period is that the front hull is welded not riveted. This was a leap forward in tank technology. Welded armour plates were much stronger than riveted plates. The rivets had a nasty habit of fragmenting inside the tank crew compartment and ricocheting around the walls, passing through any flesh the got in the way. The armour at the front of the tank is pointed and is also sloped. For an early 1930s design this is another feature that was ahead of its time. German and British tank's armour plating was vertical rather than sloped. By angling a piece of armour plating meant that an incoming shell had to pass through more metal to penetrate the protective shell than if the same piece of metal was in a vertical position. The benefit of this approach was the reduction in weight. A tank with sloping thinner armour could have the same amount of protection from enemy shells as a heavier tank with thicker vertical armour. Logs were used on Soviet tanks to help extract vehicles stuck in the mud. They were chained to the tracks. The front slope of the BT-7 tank as a two-piece drivers hatch built in. It folds forward and up to enable the driver to get into position. Also on the front of the tank there are two headlights, a horn on the left side and to tow hooks to help extract vehicle stuck in the mud. One of the common tasks that tank crews had to perform on the BT-7 was to adjust track tension. This is simply done by moving the idler wheel forward to backwards. All they had to do was unlock the locking nut and disengage the teeth. By using a large lever, like a crowbar, into a notch and simply moving it up and down it would adjust the wheel forwards and backwards to tension the track. When it was in the correct position the locking up would be tightened. The BT-7 rear drive wheel does not have any teeth just 8 holes where rollers are fitted that drive the track lugs. Christie wanted his tanks to go fast on the road. 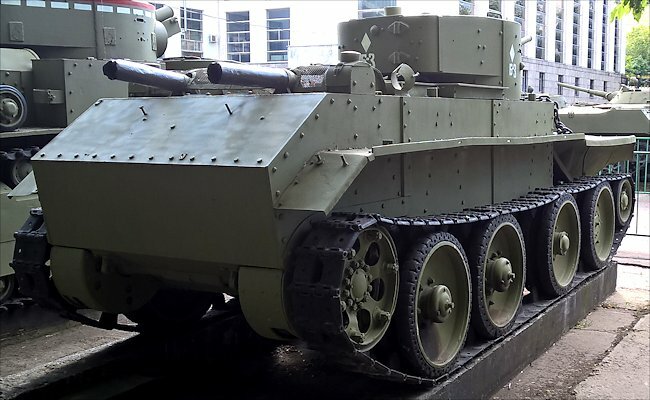 The BT-7 was designed to have the tracks removed and stored on the hull for long road journeys. Taking the tracks off only took about 30 minutes. The tank could run much faster, quieter and with much less wear and tear on the wheels than when tracks were fitted and used on roads. As soon as the tank needed to be deployed off road again, crews would simply refit the tank tracks. To do this you needed to be able to turn the road wheels. If you look at the first road wheel you will see the steering arm jutting out on the bodywork. The suspension for road wheels numbers two and three are the same. If you were to lie down on the ground underneath the tank and look up you would find that the external hull armour is just a protective covering for a large spring which coils around the centre guide. As the road wheel arm moves up and down it compresses the spring, which gives us the large range of up-and-down motion that the Christie suspension system was famous for. The BT-7 was a rear wheel powered tank. Most tanks have sprocket wheels with teeth which project out and mesh with the track to provide the forward movement. What is very unusual with the BT series tanks using the Christie suspension system is that the drive wheel is solid and does not have any teeth sticking out. If you look at the rear drive wheel you will notice there are eight evenly spaced circular holes. They are normally fitted with eight rollers that mesh with the centre guides of the track which then pushes the track forward and around the road wheels. This system worked on light tanks but it was found that it couldn't power heavier vehicles. Putting all the pressure on one central lug hanging down from the middle of a track link was just too much for the metal to take that much force. They snapped. This is why sprocket wheels were used on the heavier tanks. When the tracks were taken off so that the tank could run faster on roads the power had to be transferred from the rear drive wheel to the last road wheel. On the earlier BT tanks this was done by using a chain going from the drive wheel to the road wheel. On the BT-7 tank the designers introduced a series of gears in a protective housing that can be accessed by pulling off the last road wheel's central hub and replacing it with a simple geared hub. This enabled the rear road wheel to connect with the internal gears. On the outside of the BT-7 tank, above the track mudguard, you will find long rectangular boxes. These are not toolboxes like you find any other tanks they are additional oil or petrol fuel containers. It was only later in the war on tanks like the T 34 when external fuel tanks looked like barrels. Just by the side of the turret at the rear there is one of the access ports for the side fuel tanks that can hold 150 litres of petrol each side. There is no connecting pipe between the external fuel tanks and the internal ones that can be switched on inside the tank. If you were running low on fuel you would have to stop the tank and use a hand pump or just siphon the fuel from the external tanks to the internal tanks, whilst risking getting shot by the enemy. Many tanks like this one in the picture have logs strapped to the side of the hull. There were used by the tank crew in situations where the tank got completely stuck in mud or sand. They would take it off and chain it to the tracks at the front or back of the tank depending on which way you want to go. This acted like a massive snow chain and provided solid traction to enable the vehicle to get out of a sticky situation. On the far right of the front of the turret at the top there is a small port from which signal flags can be used to communicate instructions to other tanks. At this stage of the war only company commanders tanks were fitted with radios. 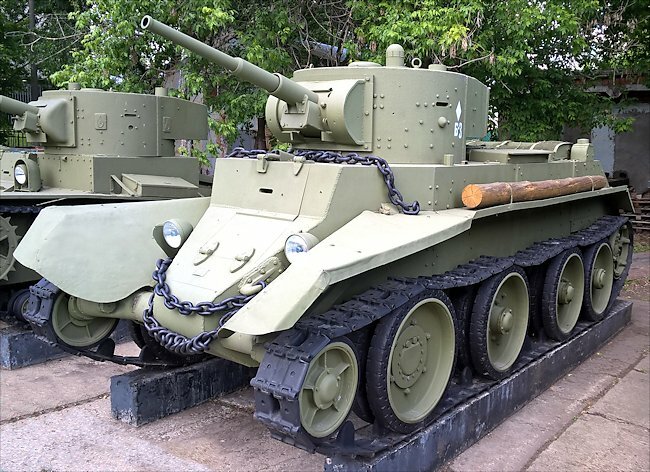 Where can I find other preserved BT-7 Tanks?